State Bank of India (SBI) Customers now can generate One Time Password (OTP) without SMS for their various transactions. 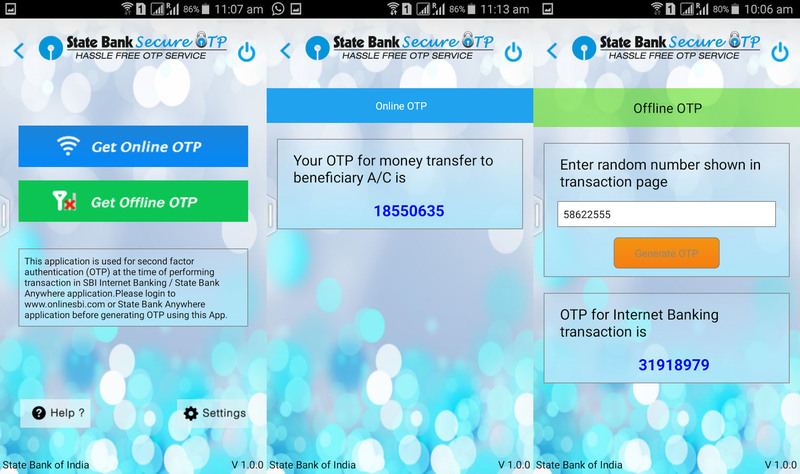 “State Bank Secure OTP App” is the solution for all those who were having problem or delay in getting OTP on their phone through SMS, now simply by installing this app called State Bank Secure OTP on your smartphone you can get the OTP Instantly for your various INB, SBI Debit Card Maestro, SBI Debit Card Visa transactions or other activities. Below is the process showing how to generate OTP for SBI Instantly without SMS. Just download and install State Bank Secure OTP App on your smartphone. Tap on the installed app to open and to register for the application enter your Internet Banking (INB) credentials. Enter the OTP received in your registered mobile number and set your mPIN to complete the one time registration for the State Bank Secure OTP App. Once you have registered for the State Bank Secure OTP application, all transactions that require OTP will prompt for online/offline mode of OTP to be chosen. This is how you can easily generate OTP instantly without SMS or without depending on mobile Service provider which has now become hassle free for SBI customers. I have a doubt, unfortunately my SBI SB secure otp app got removed from mobile. I tried to login into the app. But I can’t able to login. My question is how to reset the app and how to generate the otp. Please login to OnlineSBI and go to “Profile>> High Security Option” and deregister the State Bank Secure OTP App. You can re-register the application again in your mobile and continue using the same for OTP generation. and when i go to upgrade access level i am asked for otp. please suggest me options at my email. Irctc ticket booking otp will generate first in it. i installed and registered online OTP but i cant get my OTP for confirmation what should i do now?? Same here. Never received the first otp to registered phone number in the first place. Please advice. Which option is better to choose out of Online and Offline for faster transaction while booking train tatkal tickets. As I have once faced a problem of not generating Online OTP while booking train tatkal tickets. Both Methods Offline as well as Online to Generate OTP for SBI without SMS are convenient. My sb secure app is uninstalled accidentally. And i am unable to relogin to if anyone using sb secure Otp app and can help me with the offline Otp mode. Whenever i am doing transactions it asks for enter otp. How to generate otp on state bank secure otp app ,is it otp comes automatically in app or we try to generate otp as manually ???? if it manually how we generate otp before doing transactions or after whenever it asks otp at the same time???? If you have registered for State Bank Secure OTP App than you can generate the OTP through App by using Online or Offline option, and if you have not registered for State Bank Secure OTP App you will receive the OTP code through SMS on your mobile number for completing the transactions. I had been receiving the OTP on my Austrian mobile number till recently. However now the OTPs habe stopped coming. Even to set up the App one needs to receive the OTP at least once. How can this issue be resolved. I am not finding the app… In my app list… How will I access the app.. While making a transaction… Will it open by itself at that time? This blog for very useful and I was able to resolve my issue with Secure OTP geenration. Contacted the SBI customer care and got response to wait for 10 working days to resolve the query. I was able to do it myself by following the instructions here within minites. OPT IS NOT GENERATED WHY? I had SBI Secure OTP android app installed on my phone and was using w’out any hassle. Then, I changed my mobile handset. I uninstalled the app from my previous phone. I installed it to my new phone. I logged into OnlineSBI and followed “Profile>> High Security Option” and deregister the State Bank Secure OTP App. I logged into SBI Secure OTP app again with my OnlineSBI credentials successfully. I entered the OTP received on my registered mobile number. Now, when I set the mPIN, app is getting closed/crashed and next screen says “Open App Again”/”Send feedback”. If I click on “Open App Again”, nothing happens. I tried this many times. Everytime, I was deregestering first. Even I emailed [email protected] a week ago but no response yet. Even they didn’t bother to read my email yet. I am trying this android app on Nexus 6P which is running on Nougat 7.0. Could you please advise on this? Didn’t get my OTP for registration through I have registered mobile number. Still I haven’t got OTP. Why?? Same problem for me also.. Please let us know how to register in this app for first time?? many time install and uninstall app then also OTP is not come in my registered mobile number. My registered number is permanently off so I can’t get otp and I don’t even have Internet banking, is there anyway to get otp or pay my online bills. I have a doubt. I forgot my login password in SBI Net banking and i cannot access my mobile number also. If i gave forget password it asks the OTP. my question is how can i change the mobile number without online banking? or else how can i get OTP without registered mobile number. In such case you will have to visit your branch and submit application to change your registered mobile number with your bank account. The only option is SBI OTP generation app. Now, how to activate it if the first time requires normal OTP to be sent to the mobile number itself? It doesn’t work because the first time activation OTP is too late and the session expires. Activate the app for the first time, put in your login details, It will say enter OTP – Note down the time on your mobile. Don’t close the app. After the usual 20-30 min delay you will receive OTP but DO NOT enter it yet, otherwise the app will say Session expired. First, change your phone’s time to the earlier time you noted down(switch off automatic time in settings if on and set it manually). Then you can enter it in the open app and it works! Set your time back to normal later. You shared really useful tip for our users. I am not getting any high security password to my home and also in Profile>> High Security Option” the State Bank Secure OTP App option is disabled and when i installed state bank secure top app to register after i enter the login and password it is asking the otp to enter which i has sent to mobile but even that sms i am not receiving to my mobile. Kindly suggest what need to be done. very usefull information. thanks bro.